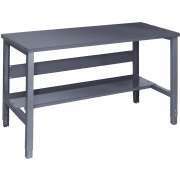 Choose Utility Tables & Workbenches: Purchase Now! 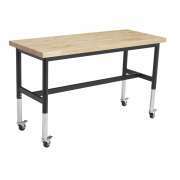 Workbenches are solid performers when you need a sturdy table for building projects or woodshop. 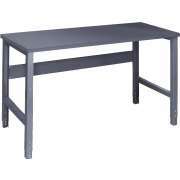 These utility tables are designed to be your main work area for heavy materials and sharp tools that might damage or destroy weaker tables. Whatever you are working on, they will give you a smooth, clean, organized surface to get the job done right. 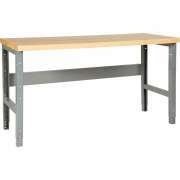 Which workbenches are good for a school? 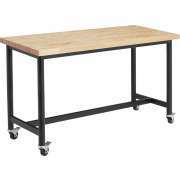 Whether you are looking to furnish your school woodshop classroom or company maintenance room, our tables are designed to handle tough tools and strong materials. They will serve you well through many years of touchups, projects and repairs. Why do you need workbenches in a school woodshop class? 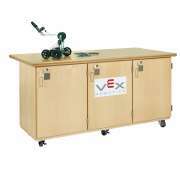 Functional workbenches are essential in an educational environment. Whether you need to outfit a professional technical high school or a woodshop classroom in a more traditional educational environment, it is critical that the right tools and furnishings are available to all students. 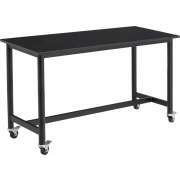 Industrial work tables will not only make your students feel like professionals, they will also help them learn appropriate and safe techniques. When you have many students working with heavy tools and tough materials, you can&apos;t afford to compromise on the quality of your furniture or equipment. A carpentry class isn&apos;t the only place where you might want to consider putting utility tables. When students are working on the sets for drama productions, or using bulky materials for artistic creations, they can come in handy as well. When projects require materials that need to be manipulated using large tools, it is important to provide a sturdy work surface to ensure safety and accuracy. 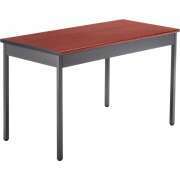 Where can a utility table come in handy? 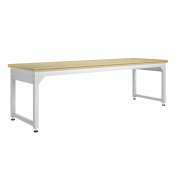 Certain employees also need the project space that is offered by a workbench. When the custodian is doing repairs on furniture or constructing much-needed mechanisms, an appropriate work space is essential. When you furnish your maintenance room with this functional piece of furniture, you ensure that your employees can make the most attractive and precise adjustments. 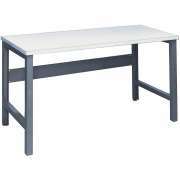 What do I need to think about when choosing work tables? 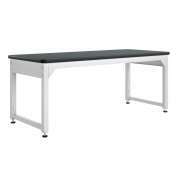 Once you have determined that you want to purchase work tables, materials and style must be considered. 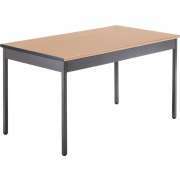 Larger surfaces are ideal for an educational setting because they enable students to work independently or in groups, while seated around the same table. This is also a good setup for large projects with bulky materials where even the pros might require an extra set of hands and group collaboration. 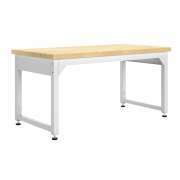 Where can I get a woodworking bench with storage? 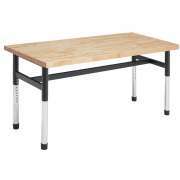 Diversified Woodcrafts offers a tough work table that includes user-friendly features. Built-in lockers underneath the work surface provide the perfect place for storing tools and accessories. With everything you need close at hand, students and employees can save time and frustration. This arrangement is great for any situation in which individuals have personal sets of tools, or need to store smaller projects that are in progress in a secure place. 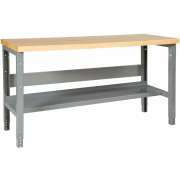 Work benches from Parent Metal products come in a number of sizes and surface materials. Their laminate, maple or steel tops are supported by steel frames. The laminate top is the budget-friendly choice while maple offers the natural strength and attractive appearance of wood. Certain bonus features can make any craftsman&apos;s experience a whole lot smoother. A built-in shelf provides a good place to keep works in progress or extra materials. Vises hold materials in place for accurate modifications and adjustments. Adjustable-height tables are convenient because they can be modified to fit with particular seating choices or to rest at a comfortable height for just about anyone. While schools of the twenty-first century are adding classes in programming and other technology-based subjects, nothing can replace a hands-on shop class. At Hertz Furniture, we know that having a great workbench is critical for accurate adjustments and quick repairs. 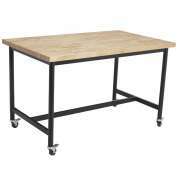 Our utility tables come from leading manufacturers and are designed for many years of construction in your workshop or makerspace. If you need help determining your ideal arrangement, or how many tables you can fit in your space, contact the Hertz Project Solutions team for free project-planning advice.